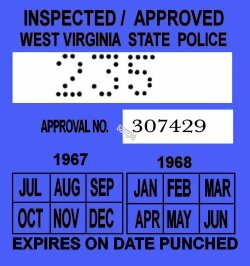 1967-68 West Virginia inspection sticker - $20.00 : Bob Hoyts Classic Inspection Stickers, Add a Final Touch to your Restoration! This 1967-68 West Virginia INSPECTION sticker was carefully restored and reproduced to completely remain faithful in size, front and back, to the original. It has our patented "Peel and Stick" adhesive to place it on your inside windshield like the original. The color could be slightly off due to fading and distortion. We are constanly upgrading stickers as we recieve good ones.